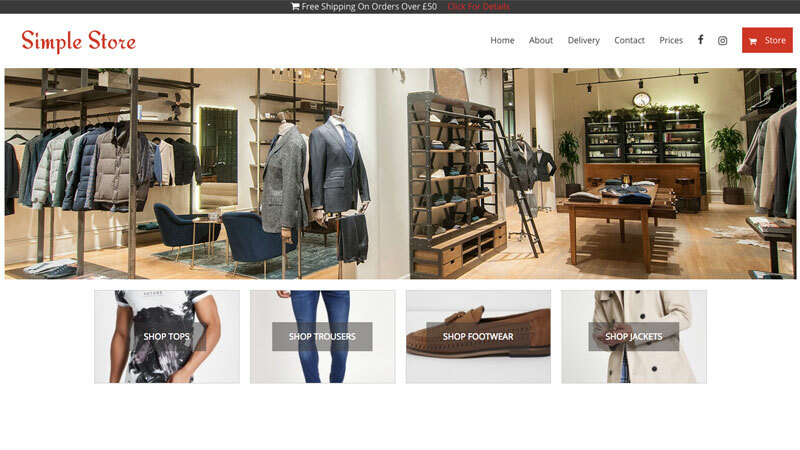 Simple Store is demo'd as a mens fashion retail website, but can be adapted for any online retail. Simple Store is a brand new template website solution built around our new Simple CMS Store: The perfect solution for any business wanting to get a simple self-managed online store up and running. We have drawn on our extensive experience of setting up and running online stores to make Simple Store not only easy to use, but also to ensure your website has all the pages required by users and legal regulation. Homepage, with "Just In" panel, links to your categories and many other essential sections. About page, which will detail your business and why customers should buy from you, not a competitor. Delivery/returns page, so your customer know exactly how long items take to arrive, and what to do if things go wrong. Contact page, so customers can get in touch with you. Store page: The heart of your retail website. Where you can limitless products into limitless categories. The store module used in Simple Store is 100% managed by you: Once logged into your dashboard you can add, edit and remove products. Change quantities, adjust pricing, make products "Featured", put items in to sale, and so on. There are no limits to the amount of product you add, and the monthly price you won't change, no matter how many products your online shop lists. Our CMS Store module can connect to most payment gateways, including Paypal, and will provide you with full sales reports. It even contains a complete customer relationship management (CRM) system, enabling you to manage your client database all in one place, with no additional costs. You can learn more about our CMS Store module here. Simple Store costs c.£300 to set up and a monthly subscription of just £30.